Though tin-rich minerals were plentiful in Germany’s Erzgebirge mountains during the Middle Ages, smelting the metal proved difficult due to the presence of substance that produced a heavy slag and leached tin away from the final yield. Frustrated metallurgists called this unwanted tin-“devouring” mineral wolf ram (wolf’s drool, cream, or soot, depending on translation), a pejorative term from which the mineral wolframite takes its name. In 1781, Carl Wilhelm Scheele predicted that the acid he had obtained by reducing a mineral named tungsten (from the Swedish tung sten, meaning “heavy stone”) contained a new element; two years later, when Spanish chemists José and Fausto Elhuyar obtained the same acid from the mineral wolframite, they succeeded in isolating the new element which they named wolfram. Confusingly, this element also came to be referred to as tungsten, while the mineral formally known as tungsten took on the name scheelite. “Wolfram” and “tungsten” remained co-listed in the nomenclature recommendations of the IUPAC (International Union of Pure and Applied Chemistry) up until 2005, when tungsten became the transition metal’s only officially recognized name. Tungsten retains the elemental symbol of W, though, and is still referred to as wolfram by some chemists and scientists around the world. Tungsten is a hard, extremely dense metal ranging in appearance from steel gray to silvery white. True to its name, tungsten is indeed heavy, but by far its most outstanding characteristic is its resistance to heat. High melting points are characteristic of the refractory metals (a group that also includes niobium, tantalum, rhenium, and molybdenum), but tungsten’s melting point of 3410 ± 20°C is the single highest of any metal--higher than the temperatures at which metals like aluminum would vaporize--and its boiling point of 5900°C is roughly equal to the temperature of the sun’s surface. Of all metals, tungsten also exhibits the highest tensile strength, lowest coefficient of linear thermal expansion, and lowest vapor pressure at elevated temperatures. Tungsten metal is also electrically conductive and possesses outstanding mechanical damping capability, extremely high resistance to corrosion, high moduli of elasticity and compression, excellent creep resistance, and the ability to absorb x-ray and gamma ray radiation. Natural tungsten is composed of five isotopes with half-lives so long they are considered essentially stable. It is the heaviest element with a known biological function (used by some enzymes), and as such is not harmful to humans and animals in quantities typically encountered in the environment. The aforementioned scheelite and wolframite are the two main mineral sources of tungsten; other less common minerals include ferberite and hübnerite. Despite its assets, raw tungsten contains impurities that make it extremely brittle and difficult to machine; producing ultra-high purity tungsten increases its malleability and ductility while retaining its thermal stability, as does alloying it with other metals such as rhenium. Commercially, tungsten is typically produced in the form of ammonium paratungstate via a multi-step process of solvent extraction and crystallization of sodium tungstate extracted from concentrated ores. Recycling of tungsten scrap is also a significant source of industrial tungsten. Tungsten metal can be obtained by heating tungsten oxide with aluminum or by passing hydrogen gas over hot tungstic acid. Its high melting point made tungsten an attractive material for use in early incandescent lamps, but overcoming the difficulty of drawing it into flexible wires was a challenge. In 1909 GE researcher William D. Coolidge developed a revolutionary process for producing ductile tungsten filaments for use in light bulbs and high-precision x-ray tubes. Coolidge’s colleague Irving Langmuir further advanced lighting technology by discovering that coating a tungsten filament with a single layer of thorium atoms and shaping it into a coil greatly enhanced performance, while using a non-reactive gas like argon or nitrogen and prevented the tungsten from overheating, opening the door for the wide use of tungsten filaments in television tubes and cathode ray tubes. Other consumer applications for tungsten include components of High Intensity Discharge (HID) and vacuum metallized reflector lamps, pigments for ceramic glazes and enamels, dyes, inks, and metal-to-glass seals due to its similar expansion rate to borosilicate glass. Tungsten has applications in numerous industries and fields of study. The metal and its alloys are the choice material for high temperature, high pressure environments. Combining the metal with nickel, cobalt, iron, molybdenum, tantalum, or rhenium yields uniquely dense and oxidation-resistant alloys and superalloys that are used in aircraft engines, turbine blades, furnace components, heating filaments, evaporation coils, melting crucibles, high voltage circuit breakers, balancing weights, vibration dampers, load-resistant crankshafts, base plates and heat spreaders, plasma spray gun nozzles, and magnetrons for microwave ovens. It is suitable as a nontoxic alternative to lead in ammunition and is frequently added to stainless steel to increase its strength. Typical tungsten-based precursors for catalysts and reagents include ammonium metatungstate, tungstic acid and ammonium paratungstate for use in lubrication, mineral separation and deNOx of emissions from chemical and power plants; tungsten oxide is a common petrochemical additive to decrease emissions and increase efficiency of hydrocarbon fuels. Tungsten carbide is an extremely dense material found in industrial machinery, cutting tools, abrasives, cermets, sports equipment, and some jewelry. “Cemented carbides” are produced by combining tungsten carbide with a nickel, copper, or iron via powder metallurgy or liquid sintering to create a flexible, high strength material that is one of the most versatile for engineering and tooling and is commonly employed as substrates and support for synthetic diamond or boron nitride cutting tips and drill bits. Tungsten electrodes doped with thorium, cerium, or other rare earth oxides are employed in gas tungsten arc welding (GTAW), also known as tungsten inert gas (TIG) or wolfram inert gas (WIG) welding. An effective neutron reflector, tungsten is frequently employed in nuclear reactors, collimeters, and for x-ray and gamma ray shielding; the first imaging equipment involved x-ray bombardment of a tungsten target. Tungsten compounds play a role in advanced optoelectronics, thermosolar cells, and other cutting-edge high technology applications. Thin films of tungsten oxide can be used as a component of smart windows; cadmium tungstate is a phosphor material used in light-emitting diodes. Tungsten diselenide (WSe2) and tungsten disulfide (WS2) belong to a group known as transition metal dichalcogenides (TMDs or TMDCs) that have gained attention in recent years many for their ability to form two-dimensional 1-atom thick monolayers similar to graphene but with a larger band gap. Tungsten diselenide has been used to create an n-type field-effect-transistor (FET), demonstrating the potential for future low-power and high-performance tungsten-based integrated circuits. Tungsten was first commercially used in incandescent and fluorescent light bulb filaments, and, later, in early television tubes. Tungsten expands at nearly the same rate as borosilicate glass and is used to make metal to glass seals. It is the primary metal in heating elements for electric furnaces and in many components where high pressure/ temperature environments are expected, such as aerospace and engine systems. Tungsten carbide is used in the production of industrial machinery, cutting tools, abrasives, and jewelry. Tungsten is available as metal and compounds with purities from 99% to 99.999% (ACS grade to ultra-high purity). Elemental or metallic forms include pellets, rod, wire and granules for evaporation source material purposes. Tungsten nanoparticles and nanopowders provide ultra-high surface area. Tungsten oxides are available in powder and dense pellet form for such uses as optical coating and thin film applications. Oxides tend to be insoluble. Tungsten fluorides are another insoluble form for uses in which oxygen is undesirable such as metallurgy, chemical and physical vapor deposition and in some optical coatings. Tungsten is also available in soluble forms including chlorides. These compounds can be manufactured as solutions at specified stoichiometries. Tungsten is a Block D, Group 6, Period 6 element. The number of electrons in each of tungsten's shells is 2, 8, 18, 32, 12, 2 and its electron configuration is [Xe] 4f14 5d4 6s2. The tungsten atom has a radius of 137.pm and its Van der Waals radius is 200.pm. In its elemental form, CAS 7440-33-7, tungsten has a grayish white, lustrous appearance. Tungsten has the highest melting point of all the metallic elements. It is found in the minerals scheelite (CaWO4) and wolframite [(Fe,Mn)WO4]. 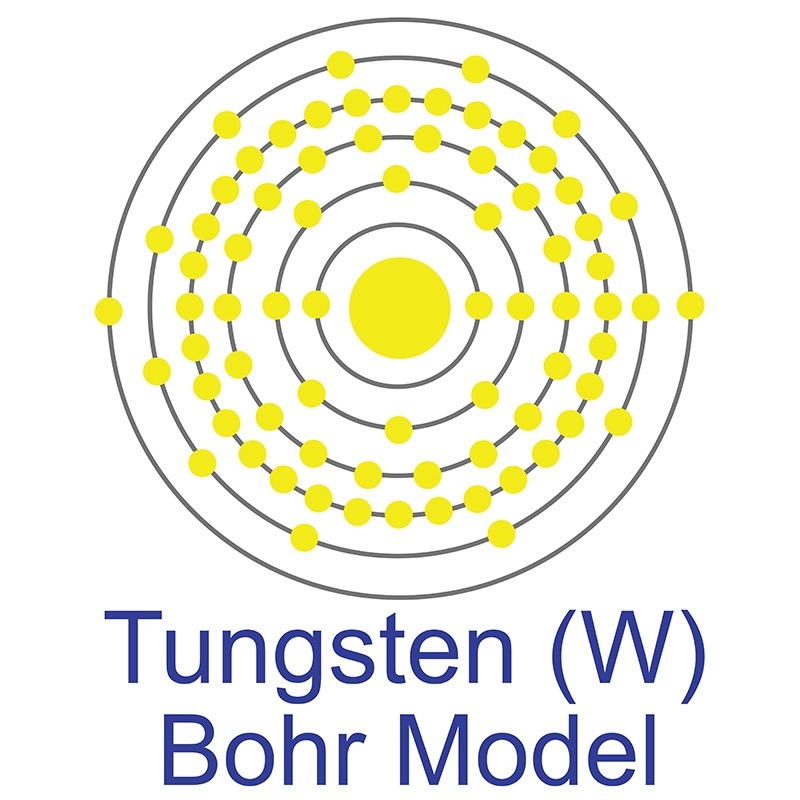 Tungsten was first discovered by Torbern Bergman in 1781 and first isolated by Juan José Elhuyar and Fausto Elhuyar in 1783. In reference to its density, Tungsten gets its name from the Swedish words tung and sten meaning heavy stone. Tungsten is considered to be mildly toxic. Safety data for Tungsten and its compounds can vary widely depending on the form. For potential hazard information, toxicity, and road, sea and air transportation limitations, such as DOT Hazard Class, DOT Number, EU Number, NFPA Health rating and RTECS Class, please see the specific material or compound referenced in the Products tab. The below information applies to elemental (metallic) Tungsten. Naturally occurring tungsten (W) has four stable isotopes: 182W, 183W, 184W, and 186. Additionally, 180W has an long half-life of 1.8 ± 0.2 Ea (1018 years).